Graduating from SIUE in 1983 with a Bachelor of Science in Accountancy, Derek Barnard is currently a tax partner at Anders CPAs + Advisors. Joining the firm in 1999, he focuses on tax and succession planning. Although accounting was not his intended academic focus, once he found his love for the subject, he hit it head-on. He has worked in public accounting since graduating. As a commuter to campus, Barnard expressed he enjoyed his time at SIUE while attaining his degree in three years. He was able to meet many new people and worked as a lifeguard during this time. The short commuting experience allowed him to enjoy his time on campus and focus on his studies. Barnard still has many contacts and friends at SIUE and has recently been more involved with the School. His employer contributes to SIUE by providing a scholarship to the accounting department. Even with a busy schedule and pressing responsibilities, he is still on the Accounting Advisory Board and attends as many events as possible. Dominique Matlock (anticipated BSA December 2017) continues the success of past SIUE attendees of the Mary T. Washington Wylie Internship Preparation Program (MTWW), which was held in Chicago over three days this past January. The Illinois Society of CPAs describes the program as an “award-winning, … all expenses paid program available for … underrepresented … college sophomores, juniors, or seniors”. As this year’s MTWW attendee, Dominique spent the first two days of the program taking in career/career management advice and networking. Some of Dominique’s strongest impressions came from guest speaker Kimberly N. Ellison-Taylor (Chairperson of the AICPA Board) who shared her career journey, a tour of Grant Thornton’s downtown Chicago office, and the networking event attended by the Big Four and about 10 other large firms. After all the career advice, stories and networking, Dominique said she began to see a path to an accounting career as realistically doable—tough, but doable. She describes her overall MTWW experience as amazing and transformational. On the last day, the MTWW program randomly assigned three firms to interview each attendee. Dominique felt comfortable interviewing, because the first two days of resume building, interviewing advice and networking had not only prepared her well, but also allowed her to meet the people with whom she interviewed. According to Dominique, the firms’ partner and employees had made themselves very approachable over the course of the program. She left the MTWW program with an internship offer from Grant Thornton’s Chicago office that begins January 2018, right after she graduates in December with her BSA and 150 hours from SIUE. Congratulations, Dominique! Beta Alpha Psi (BAP) officer Amelia Biggs (expected BSA December 2017) won the Project Run with It (PRWI) consulting competition at the 2016 BAP National Conference. 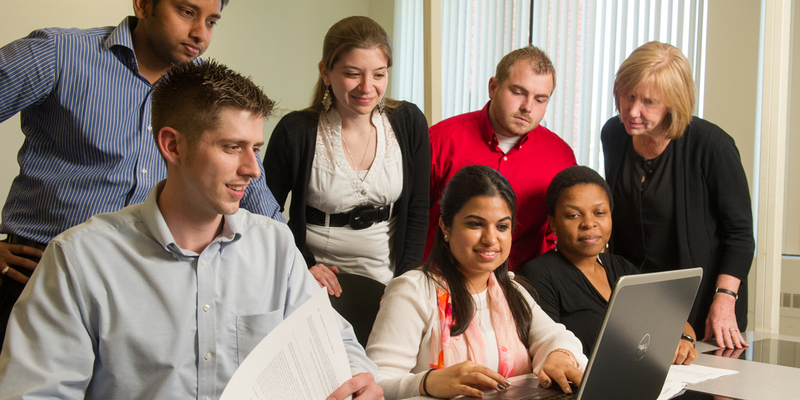 BAP is the nation’s premier academic accounting honor society. Being selected as a contestant for the competition is extremely competitive, and winning first place is quite an accomplishment. The PRWI Committee selected Amelia from dozens of applicants based primarily upon her outstanding application essay. BAP describes the PRWI as a high-intensity competition that gives students the opportunity to respond to an actual request for proposal for consulting services from an actual not-for-profit. The competition hosted four teams with four students each. The short lead-time between getting the case and presenting makes PRWI more intense and realistic. Each team receives the case at 5:00 pm and hands in their material by 4:00 pm the next day, just before presenting. Her team’s case was “Back on My Feet Baltimore,” an actual NFP that integrates running - yes, running - with employment support to combat homelessness. Interestingly, Amelia is an avid long-distance runner. Amelia says that staying up until 3:00 a.m. working with new teammates from Old Dominion, Utah State and Western Kentucky Universities was an exciting opportunity to test herself in a more real-world setting. She hopes that other BAP students at SIUE will have the same opportunity to compete in PRWI that she has had. As acknowledgement of her success, Amelia received a plaque, and sponsor Moss Adams LLP awarded the SIUE BAP Kappa Lambda Chapter $1,000. Amelia is currently finishing a tax internship with Anders CPAs + Advisors. After graduating with her BSA in December, Amelia plans on completing her SIUE MSA and pursuing a career in public accounting. Congratulations, Amelia! On the first day of my “Intro to Tax” course, I ask my students how many of them want a career in tax. A few hands might raise, but most students are only there because they are required to take the course to graduate and take the CPA. Not many of the students have ever done a tax return, even their own. While I let them know that a tax career isn’t for everyone, I do warn them that I plan to lure some of them over to the “dark side” of the accounting profession where you can be an advocate for your client and being creative is rewarded. I have had success winning some of them over. Our tax specialization within the graduate program has grown since I arrived in 2013. We would like this growth to continue, allowing us to offer an even greater range of course options. Right now, we offer graduate courses in tax research, advanced individual taxation, corporate tax and partnership tax. We plan to offer a seminar in tax course in the future, which will cover other tax topics, such as state and local taxes. My approach to teaching is very hands on. Starting with the intro to tax course, students are required to prepare tax returns by hand so they really understand the flow of the return. By the end of the tax program, students will have prepared a complicated individual return, a partnership return, a corporate return, a gift tax return and an estate tax return. I also push students to understand the material and apply that knowledge. This might require them to research whether or not donating a kidney would qualify for a charitable deduction or calculate the most beneficial way to structure a corporate merger. My background is a mix of public and private accounting. I started out at a medium-sized accounting firm before moving to Coopers and Lybrand (now PWC) for a few years. I left public accounting and worked as a tax manager at Purina Mills until it was purchased by Land O’Lakes. I then worked as a senior tax manager for Premcor Refining Group, working mainly on special projects and tax incentives. When Premcor merged with Valero, I decided to pursue my PhD at the University of Arkansas. After graduating in 2010, I accepted a position at the University of Wisconsin–Milwaukee where I taught tax courses and worked on various research projects. Desiring to return to the St. Louis area, I accepted my current position at SIUE in 2013. While the main reason I took a position in academics was to impact a future generation of accountants, I still like to contribute to the profession through my research. My dissertation “Does Mandatory Disclosure Affect Recognition of Contingent Liabilities? Evidence from FIN 48” won the dissertation of the year award at the Midwest Regional Conference in 2011. I have published research in several academic journals such as the Journal of the American Tax Association, Advances in Accounting and Advances in Tax. I have also published in several practitioner focused journals including Journal of Accountancy, The CPA Journal, Tax Notes, State Tax Notes and Business Horizons.